PC's Blog: Ooooh! Check it out! PC, The new cover is beautiful!! I am tempted to buy all the books again now lol! 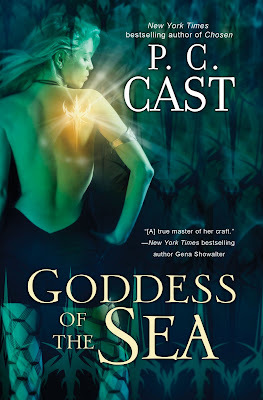 Plus I think Goddess of the Sea is my favourite of the Goddess Summoning books! But then there is Goddess of the Rose too, I like that one, and then there is..... I think I just love them ALL!!! So little time!! I understand. Have to say that I totally enjoyed Warrior Rising, I was sorry it had to end. Which lovely Immortal Warrior will you do next?? People who haven't read these books are MISSING out! Ohhh can't wait for that!! Its gonna be sweet for sure!! How long do we have to wait??? If I remember correctly the release date for GODDESS OF CAMELOT is June. Sorry for the wait, but I have to actually write the book! i am so happy that your books are being reissued. i have all of them and have been eagerly awaiting each one that is published, usually finishing them in way too short a time. all are my favorite and i never get tired of them. i can't wait until september. you and kristin are awesome! p.s. i miss your site. can't wait til it's back up! My name is Beth Duncan and I am a middle school teacher in Vista, CA. Books and reading are my passion, and I really work hard to share it with my students. I developed a program here in San Diego called Recommended Read. I partner with Barnes and Noble and my students read and review books for them. This year I have made amazing contacts with many authors- and they have sent my kids ARCs of books to read and review for the release date. Your House of Night series is very popular, especially with my 8th, 9th, and 10th grade students. Would you be willing to send us the ARC Untamed, or Goddess of the Sea, or any of your future books? We would be honored [and totally excited] to review your books. I'll check your blog for a reply. Thank you so much for writing such wonderful stories. I'm so glad they are being reissued. I hate when books in a series doesn't match on the shelf, so I will buying all four again!